In 2018 we added 81 preschool and primer games to the printables section of Teach Piano Today’s Wunderkeys website! There are now well over one hundred fun activities that you can print and play at a moment’s notice. In 2019 we have no intention of slowing down our printable output! Today we’re back with another fun ear-training game to play with your late preschool and early primer students. In this activity your students will have a blast learning to listen for, and differentiate between, quarter notes and half notes. As with all of our games, the setup is simple: all you need is the printable, a piano and a coin. Download the game below. When you click on the image below, you will be taken to our WunderKeys Printables Page where you can find Hog-Wild Ear Training (click on the Ear Training tab) and over one hundred other activities. Also, while you’re here, don’t forget to check out our WunderKeys Method Books on Amazon. 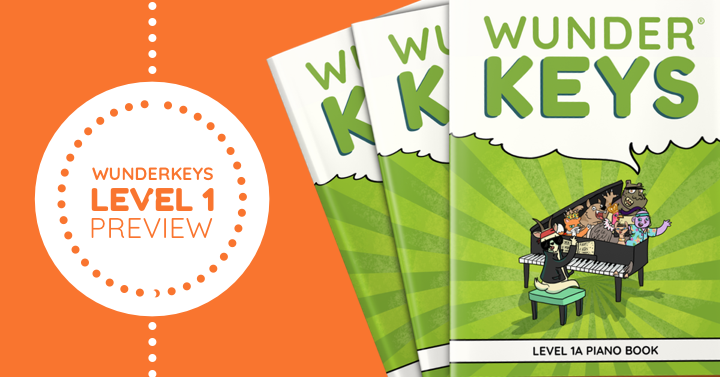 Our most recent release, WunderKeys Elementary Piano Level 1A is already a #1 New Release! 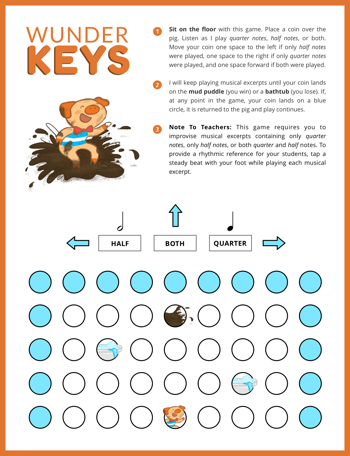 With the release of WunderKeys Level 1A just around the corner, we wanted to take some time to let teachers in on a method book that we think will change the way children learn the piano. Eight months of writing, composing, editing and revising has culminated in something teachers will treasure for years to come. 1. Will there be just the one Level 1 book, or will it be divided into three separate books like the Primer Level? WunderKeys Level 1 is a two-part series that includes WunderKeys Level 1A and Wunderkeys Level 1B. The upcoming release will be of WunderKeys Level 1A. WunderKeys Level 1B will follow in September of 2019 in time for your graduating 1A students. WunderKeys Level 1A is divided into 8 units. Each unit will take your piano students approximately three weeks to complete. Faster students may move through the book in 20 weeks but we can tell you that we have been working hard through this book with our own seven year old daughter and she is consistently requiring three weeks per lesson. 2. How many components will make up each lesson? Will it be game/activity based like the other books? I’m so excited for this release! We’re so glad this question was asked! The WunderKeys Method Books are composed to create a “lesson-in-a-box” musical experience for teachers and students. We want teachers to spend their time and energies on their students, not on lesson planning. With these books you can steal back your free time… endless hours spent scouring the internet for creative teaching approaches will be a thing of the past. WunderKeys Level 1A is an immersive musical experience. We’ve developed creative activities that keep kids active and engaged while ensuring notated music remains central to each activity. Your level 1 kids will never again be bored on the bench. In fact, we’ve taken the best of everything we’ve created over the past 5 years and packaged it into the Level 1 method book you’ve been wishing existed! Each unit in WunderKeys Level 1A contains an introductory instructional page, a “pick your path” sight reading module, technical exercises/warm-ups, “lap and clap” rhythmic duet experiences, game-based ear training, enjoyable teacher duets, and of course… lots of exciting piano solos. 3. What concepts will be covered? While there are many concepts covered in WunderKeys Level 1A, the major elements include staccato and legato (while reviewing the C 5-Finger Scale), reading Treble C-D-E-F-G, hand movement within a piece, melodic and harmonic intervals of a 2nd, 3rd, 4th and 5th, half rests and whole rests, and hands-together coordination. In WunderKeys Level 1B the main concepts covered will include notes in the G 5-Finger Scale, eighth note rhythms, accidentals and I chords. 4. Is it geared towards young students still, with cute stories? Or is it assuming a slightly more mature user? Stories bring life to the WunderKeys Method Books, so before we answer this question we should probably explain why we make stories an essential element of any WunderKeys adventure. If children are going to be successful at the piano, then they need to be motivated to get their books out of their music bags on days when they do not have piano lessons. While other piano books can be tossed to the side when kids get home from lessons, WunderKeys books are read as bedtime stories, shared with grandparents and acted out with friends. When it comes to home piano practice, the biggest challenge is simply getting the book out of the bag… and we’ve got that covered! But there’s also a much more technical justification to our story-based approach. When kids are learning piano, emotion is a difficult element to integrate into their play. For this reason, young children can be rather robotic players. While tempo markings may tell a a child to play “with energy” or “with playfulness” these somewhat arbitrary words are usually ignored. Contrast that with a piece of music that tells the story of a goat sneaking over a creaky bridge while avoiding a stinky, old troll and it becomes easy to understand why WunderKeys kids are destined to play with more expression! As you may have guessed from the first part of this answer, stories are still a part of WunderKeys Level 1. But we understand that your students are growing up, and so the stories and the role they play within this book, are changing. In WunderKeys Level 1A, the stories serve to set the stage for each musical activity while not interfering with the amount of material found within each unit. In fact, you’ll discover that WunderKeys Level 1A has as much music as many full-year method books! While we don’t want to give too much away about the laugh-out-loud tales you’ll find in the book, we can say that the fairly twisted telling of some well-known tales will have students of all ages laughing out loud. 5. Will there be pieces the students will recognize? Folk tunes, classical, etc.? Arrangements of popular classical and folk tunes. Now, if you know anything about Trevor and I, it will come as no surprise that when it came time to incorporate recognizable tunes into each unit, we twisted some popular pieces and turned them into motivating teacher-student duets that will have your students giddy with musical glee. 6. What age do you suggest is the minimum and maximum for this? Which students can I use this with? The curricular development and instructional design of WunderKeys Level 1A means it can be used with kids from 6 to 11. With that said, the ideal ages are 7 to 10. Advanced 6 year olds will be well suited to the book while 11 year olds who still get a kick out of a story-based approach will also find success. This book serves as a continuation from WunderKeys Primer Book 3 but can also be used with any students who have recently completed a different primer level method book. 7. When and where can I buy this book? WunderKeys Level 1A is all set to breathe life into your lessons in the New Year! It will available on Amazon soon after Christmas… in time to have it ordered and ready for your students’ return in January. Stay tuned in our WunderKeys Facebook group for the big announcement! We hope that you have enjoyed our WunderKeys FAQ. Check back next Saturday when we share a visual sneak peak! Do you teach piano students who struggle with note reading? Do you find yourself writing letter names above the notes in their music? The truth is, while note reading is “the big thing” for early piano players, more students rely on memory than note recognition when playing piano pieces. And this leads to a host of problems. There is, however, a note-reading tool that works wonders but rarely gets pulled out of a teacher’s bag of tricks: sight reading. Sight-reading activities stop kids from “guessing” at note reading and forces them to actively pay attention to the notes on the page. 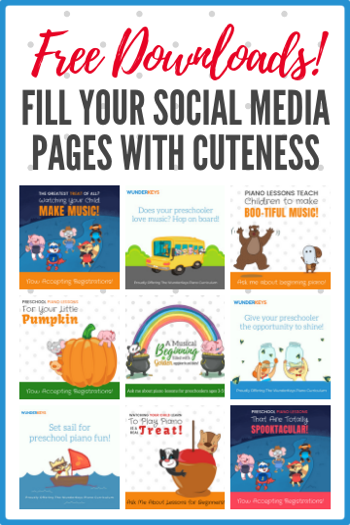 Because many kids find sight reading scary, today we’re sharing a game-based holiday printable that will delight your students as the most exciting time of the year approaches. 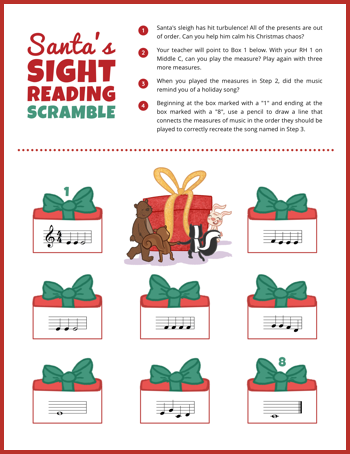 Click on the image below to download your copy of Santa’s Sight-Reading Scramble. If you want to keep your piano studio hip and your teaching schedule hoppin’ then you’ll want to be posting regularly about your music lessons on Facebook. Even if you don’t have a dedicated Facebook page, sharing a little about your piano teaching on your personal social media pages will make sure that you are first person people reach out to when they want lessons for their kids. But what can you post that will get noticed? Well, we’ve got that covered for you! To download the Social Media Pack click on the image below. Because this is a large file, the images will be downloaded onto your computer in a ZIP file. Right click the file and select “Extract All” to access the images. When piano students move out of Middle C position and into the C 5 Finger Scale for the first time, it is common for them to experience their first moments of note-reading frustration. While their right hands are hanging out with familiar keys and notes, their left hands are on an adventure of their own. To avoid bass clef frustration, a note-by-note approach to learning is beneficial for young learners. It gives them the time and the repetition needed to remember each note’s position on the staff and the related key on the piano. And, when notes are presented one or two at a time, kids can easily compare and contrast new notes to other notes on the staff. Today’s printable compares two bass clef notes that are commonly confused by young piano students: Bass D and Bass F. As they are both line notes, your piano students will likely need a lot of repetition to avoid confusing these two “trouble makers”. 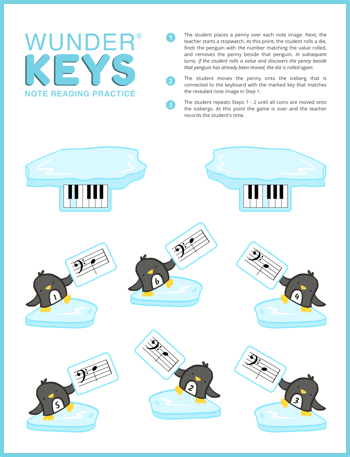 When you click on the image below, you will be taken to our WunderKeys Resources Page where you can find Bass Note Penguins (click on the Note Reading tab) and a treasure trove of other printables.